A recent release from Bachmann Trains brings the company’s wide-nose General Electric (GE) Dash 8-40CW model back to the N-scale market. For this new production, this six-axle diesel locomotive release includes factory-installed Digital Command Control (DCC) electronics and sound output. Retailing for $319 each, Bachmann’s N-scale GE Dash 8 with DCC Econami Sound Value comes decorated for Canadian National, CSX, Norfolk Southern, Santa Fe, and Union Pacific. 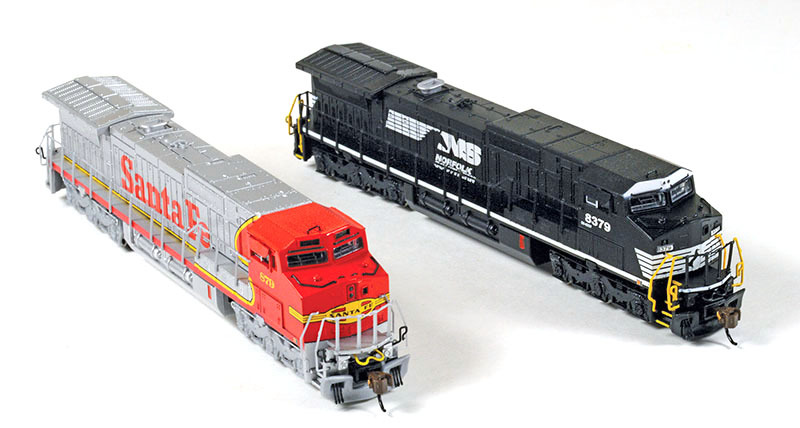 SoundTraxx produces the DCC and Econami sound for these N-scale models. The NMRA-compliant decoder operates in dual-mode (DC or DCC) and controls the model’s directional headlights, and flywheel-equipped motor. The motor resides in a die-cast metal frame. The plastic shell includes a number of separately applied details. Bachmann’s N-scale Dash 8 can present prototypes with headlight located over the cab windshields, as well as the version with the headlight mounted in the nose. The model comes with Bachmann’s E-Z Mate Mark II knuckle couplers. This N-scale Dash 8-40CW arrives in a clear plastic jewel case with warranty card, Bachmann catalog offer, and Quik Start guide for using the DCC-sound features. This model’s history dates back more than two decades with a 1997 introduction for a standard cab Dash 8-40C and wide-nose Dash 8-40CW coming out for Bachmann’s Spectrum series. Watch for a review of these new N-scale Bachmann Dash 8-40CW diesel locomotive models by Shane T. Mason in a future edition of Model Railroad News.